"Crash" is up for six Oscars: Best Picture (the award would go to producers Paul Haggis and Cathy Schulman), Best Director (Paul Haggis), Best Supporting Actor (Matt Dillon), Best Original Screenplay (screenplay by Paul Haggis and Bobby Moresco; story by Paul Haggis), Film Editing (Hughes Winborne), and Original Song ("In the Deep" with music by Kathleen "Bird" York and Michael Becker and lyrics by Kathleen "Bird" York). "Crash" is an urban drama, based on the personal experience of writer/director Paul Haggis, which is meant to illustrate the complexities of racial tolerance in contemporary America. The story does not unfold from just one character's point of view. No one is safe in this film about the way human beings "crash" into one another. Everyone gets their share of scorn and derision, and there is not a moment of political correctness that is not unmasked. See photo essay for more "Crash" pictures. 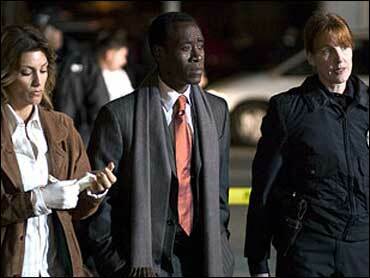 See photo essay for Don Cheadle pictures. See photo essay for Sandra Bullock pictures. See photo essay for Terrence Howard pictures. See photo essay for Matt Dillon pictures. See photo essay for pictures of a winning night at the Screen Actors Guild awards. Watch video to see Don Cheadle's interview on The Early Show. Watch video to see Matt Dillon's reaction to his Golden Globe nomination. Find out about all the nominees in the Academy Awards special report. Don Cheadle, who acts in the movie and served as one of its producers, said during an interview on The Early Show, "The script felt like real people saying real things in real situations. That was the attraction for me. This isn't a polemic, and this isn't some sort of investigation of race. It's not. We're not trying to wrap anything up in a bow or give any lessons." Also featured in "Crash" are Sandra Bullock, Matt Dillon, Jennifer Esposito, William Fichtner, Brendan Fraser, Terrence Howard, Chris "Ludacris" Bridges, Thandie Newton, Ryan Phillippe and Larenz Tate.